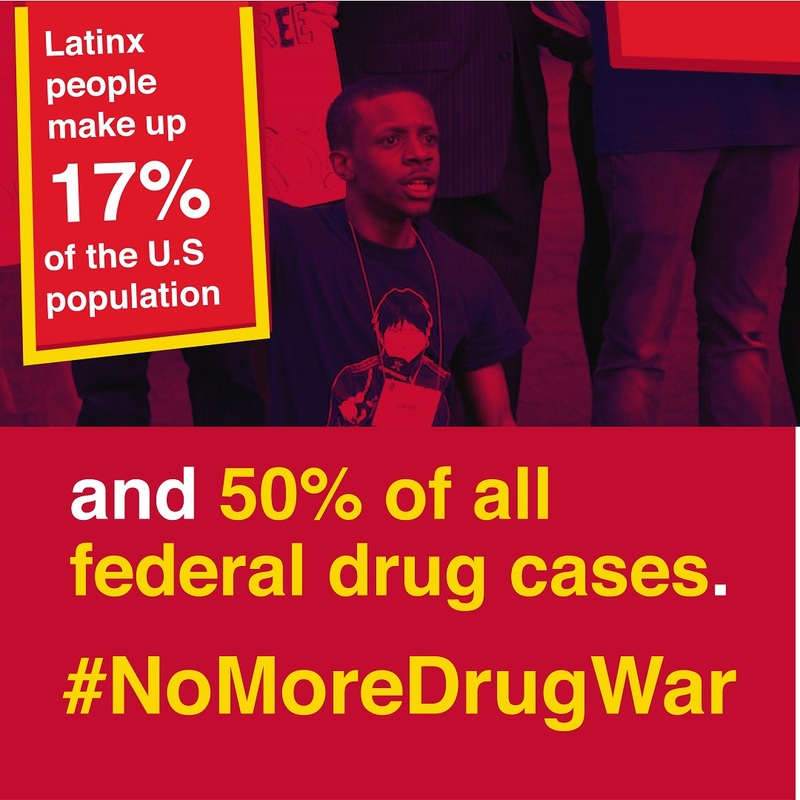 In the U.S., the war on drugs has failed to reduce the harms of drugs – while causing the systematic over-criminalization and mass incarceration of Latinxs. The drug war fuels racial profiling, violence against immigrants, intrusive government surveillance, and militarization of local law enforcement and our international borders. 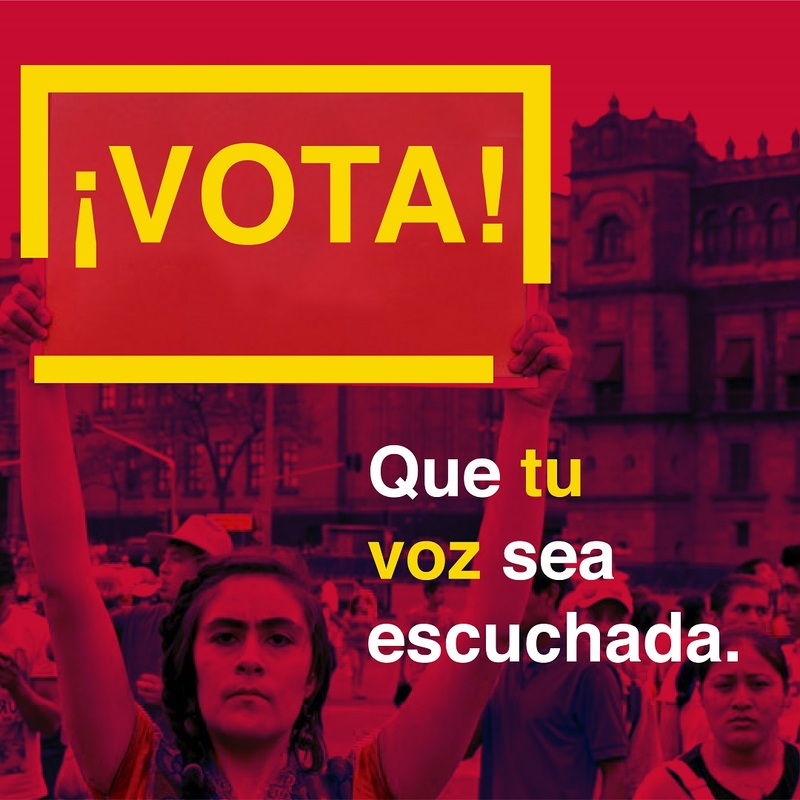 Latinx people have a huge stake in fixing our disastrous drug policies. Will you join us? 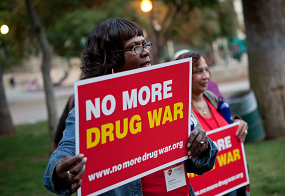 Sign up to receive action alerts and news from Drug Policy Alliance. 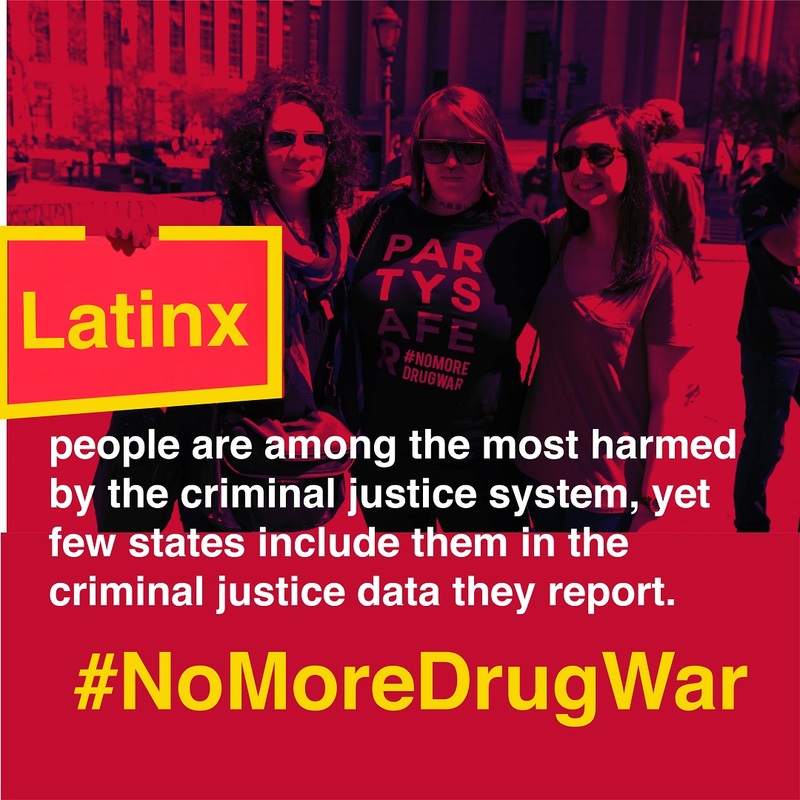 As Latinxs we have the responsibility to help end the failed drug war. According to the most recent data, simple marijuana possession is the 4th most common cause of deportation for any offense. 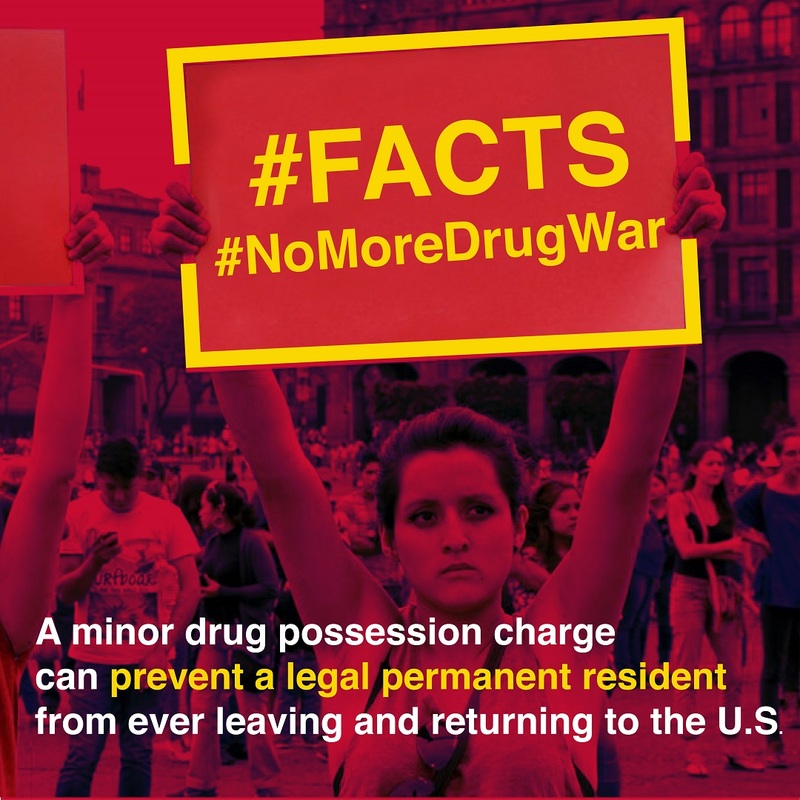 Minor drug possession charges can also lead to inadmissibility from entering the U.S. for noncitizen residents – meaning that, even if a minor offense doesn’t lead to jail or deportation, it can prevent a legal permanent resident from ever leaving and returning to the U.S.
50% of federal drug cases are brought against people classified as Hispanic, even though this group makes up just 17% of the U.S. population. Although we know Latinx people are disproportionately harmed by our criminal justice system, there is a serious lack of data. Few states include Latinxs in the most criminal justice data they report. In New York City, though, we know that Latinxs are arrested at nearly four 4 times the rate of whites for marijuana, even though Latinxs and whites use marijuana at comparable rates. 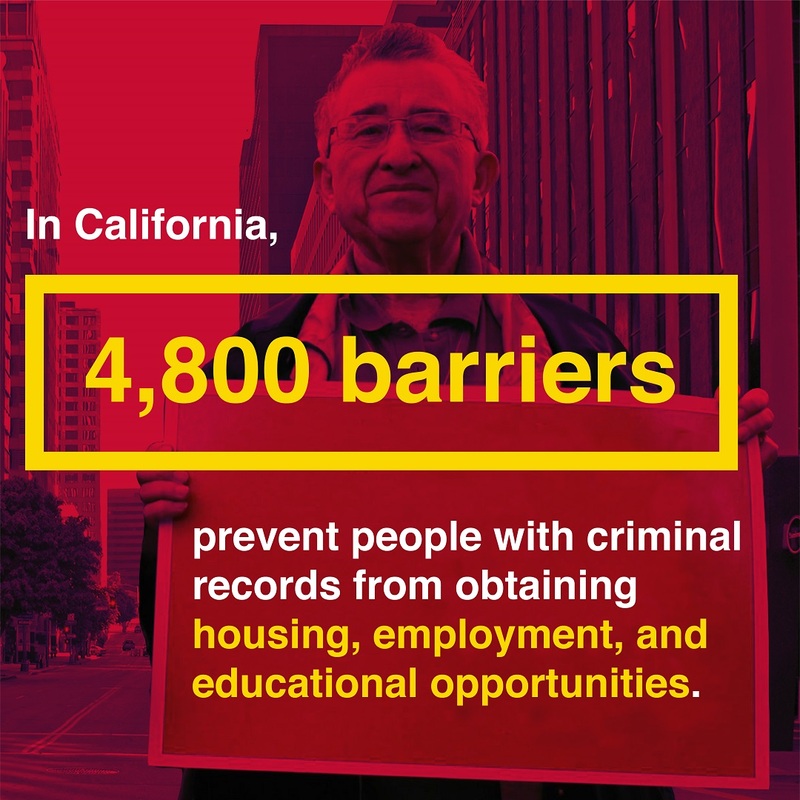 In California, where DPA played an instrumental role in legalizing marijuana and de-felonizing drug possession, we are collaborating with several community partners to advocate for the release of people incarcerated for marijuana convictions and the expungement of drug convictions. In New Mexico, DPA has also worked with community partners to remove barriers to employment for people with criminal convictions, including passing the first statewide "Ban the Box" initiative, which stopped public employers from asking about criminal justice system involvement on job applications. Several other states have passed “Ban the Box” initiatives since. 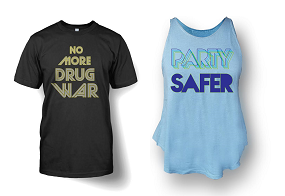 Harm Reduction is a public health philosophy that includes interventions to reduce the harms associated with both drug use and dangerous drug policies. Harm reduction is also about also changing the language we use to talk about people who use drugs, to help end the stigma and dehumanization often faced by people who use drugs. 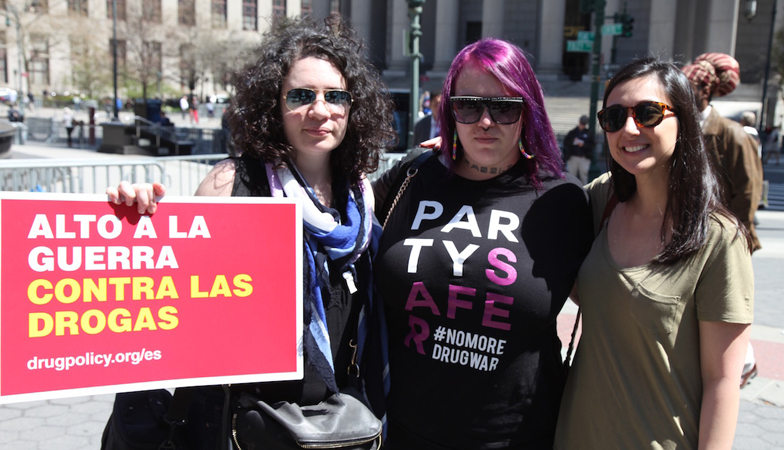 A lack of culturally-informed health and social services, especially in many Latinx communities, has led to the death, incarceration, and deportation of many Latinxs simply for using or possessing a small amount of an illegal drug. Mass incarceration and deportation have done nothing to curb drug use within our communities – while making the problem worse. While treatment for problematic drug use exists, many people are unable to afford it or access it. If you or someone you know struggles with problematic substance use, learning about harm reduction can be key. Latinx and other communities of color have historically suffered the brunt of marijuana prohibition. Legalizing marijuana creates opportunities for entrepreneurship, employment, training and business development in marginalized communities. 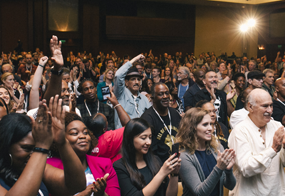 It also creates opportunities for state and local governments to collect tax revenue that can be re-directed to repairing the harms of mass incarceration and the drug war in our communities. 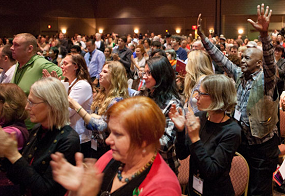 Some cities and states have implemented social equity programs. One example is Oakland, CA, where the Oakland Equity Permitting Program aims to promote equitable business ownership and employment opportunities in the marijuana industry, especially for people unfairly harmed by the war on drugs. The Drug Policy Alliance advocates for incentives and provisions for minority cannabis entrepreneurs, the investment of marijuana tax revenue in communities most harmed by prohibition, and employment opportunities in the marijuana industry for formerly incarcerated people. Find out more about our work for responsible and equitable marijuana legalization. We know that some young people use drugs. That’s why we need drug education that focuses on keeping kids safe – not just by encouraging them to avoid drugs, but also by providing information on how young people can reduce risks if they or their friends do use drugs. School is a key place where this type of education ought to be available. DPA’s Safety First: Real Drug Education for High School Students is the first-ever high school drug education curriculum grounded in harm reduction, which was piloted at Bard Early High School in New York City, in a racially and economically diverse classroom. It teaches young people essential drug knowledge, while asking them to think about the impact of drug policies on the Latinx community and other communities of color. But we must also go beyond schools and other formal places of learning. DPA’s Safer Partying campaign reaches young people at festivals, concerts and clubs. The Safer Partying campaign has provided this education at several major festivals in southern California heavily attended by young Latinxs. Drug prohibition — which the U.S. has pushed for decades — is a major factor fueling violence and corruption in Latin America. The U.S. has provided billions of dollars to countries around the world to try to stop drug trafficking, particularly in Latin America. This has spurred policies that facilitated the militarization of Latin American police forces, leading to extreme violence as organized crime fought to control profitable illegal drug markets – with devastating effects for many people caught in the crossfire. Drug prohibition wreaks havoc on state institutions, with organized crime often corrupting authorities to protect their interests. Many of our families and friends emigrated to the U.S. to seek opportunity, often fleeing violence and corruption in their home countries. 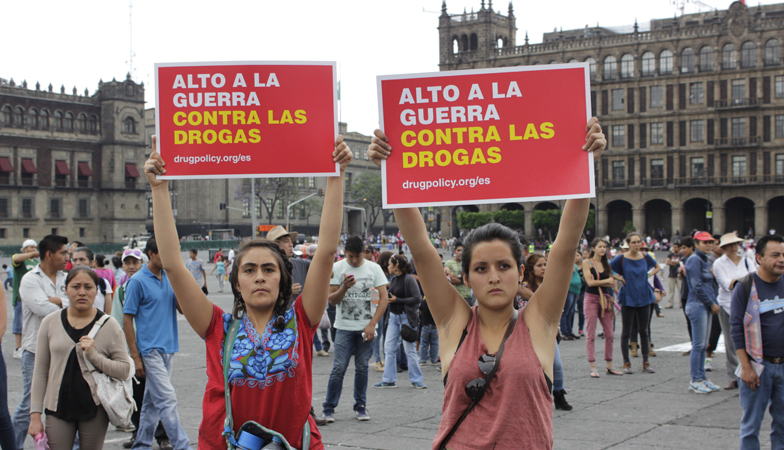 Ending the failed drug war would reduce militarization and drug war violence in Latin America, improving the lives of Latinx throughout the hemisphere. Other resources are available from Energy Control in Spain in Spanish and English. Share these to start the conversation on your social channels.